(Newser) – A New Jersey couple who had to leave their wedding reception early when the bride suffered an allergic reaction is about to get a free do-over, the AP reports. Victoria Tumolo told the Courier-Post of Cherry Hill she was dancing at the September reception when she became ill and started to have trouble breathing. As a nurse, she realized what was happening and soon her father was administering an EpiPen through her wedding dress. "I had to take my dress off outside so they wouldn't cut it off me when we got to the hospital," Tumolo said, noting that her new husband, Dominic, and her mother took off her dress together. 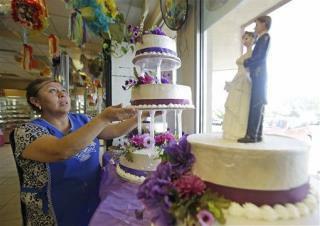 "Not exactly what I was imagining for our wedding night," Dominic Tumolo said. Sympathizing with the newlyweds' plight, their caterer and the owner of the entertainment company that performed at the wedding teamed up to offer them a complimentary second reception to be held Sunday. The Tumolos say at least 150 of the 250 guests who attended the first reception will be able to attend the second. Volunteers will do the bride's hair and makeup, and the wedding photographer will also return at no cost. Victoria Tumolo says she's learned that she's allergic to milk and almonds, and that the symptoms manifest after exercise (in this case, dancing). She was treated and released, but the couple missed the rest of the reception. "I wanted everyone to stay and have a good time," Victoria said. "There was a lot of confusion, and some people knew what was going on." Hopefully she isn't allergic to comments. R.C.I. once gave us a full complimentary week when a family member died on day 3 of a 7 day visit to Chateau Orleans. I think grandma was pissed we went without her so she showed us. >> "allergies... the symptoms manifest after exercise" First exercise she's had for quite a while, I guess.